” Immigration puzzle – A Diagnostic Account ” – July 30, 2018. 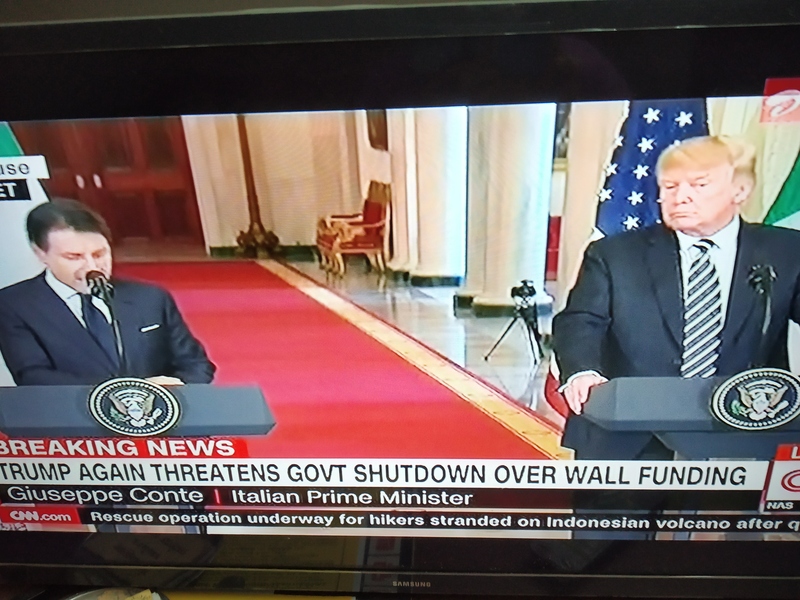 Donald Trump and Giuseppe Conte address the press on July 30, 2018, after their meeting in the White House. The inference I draw from his words is that both Donald Trump and Giuseppe Conte view the “migrant crisis” prevailing not just in Europe and America but all over the world as a precursor to a much larger problem unpredictable at this moment. If globalisation has shrunk the “cyber-borders” while promoting tech, people engagement, and prosperity; it has also shrunk the “physical-borders” enabling and accelerating the physical movement of people making time and distance almost irrelevant. As any new technology brings with it some unanticipated evils, migration of people also brings some threats with it – many with potential to tilt the balance of social harmony. It is now a highly endowed political tool to weild deftly for winning elections. The spat between Republicans and Democrats over illegal immigration may just be the tip of the iceberg to a huge problem with potential to alarm the locals and even endanger the security situations in border areas. While many may hold the view that immigrants stealing the jobs of nationals as the main problem, Trump’s view fits to a good extent with our former Deputy PM, LK Advani’s characterisation of it being a “Security Threat”. If the US is affected by its long and varied observations of people pouring in from Mexico, India has been embroiled in a migrant crisis with inflow of people from Bangladesh, Pakistan, and Myanmar (recently) mainly since the 1950s. If the US holds the perception that the migrants tilt the balance of vote politics regionally and even nationally, India too experiences the change and trials of life of its citizens economically and politically, in specially West Bengal. If the US perceived the need for strict border control for the good of locals, India also shares similar perceptions while passing through the course of events which affect its citizens. While a majority of migrants are economic refugees, it is not completely free from anti-national elements. There are more than 29 m illegal immigrants from Bangladesh alone in India. Most people settle in West Bengal, Assam, .. .. and even have moved to cities like Bombay, Delhi, Bangalore .. .. to Kerala where wages are low. (f) Risk by terrorists who use these immigrants as couriers and agents to carry out Anti-national activities. – (e) Negotiated settlements and assistance to the poor nation for growth (good, but cannot solve the problem fully through life). So what is needed is a judicious combination of measures applicable to individual nation(s), according to the prevalent conditions in time. “Negotiated settlements” and “border fence erection” constituted India’s mode and rule of accomplishing normal characteristics of the lives of people. – Atal Behari Vajpayee government in 1998 awarded the construction of Indo-Bangladesh border barrier to stop migrants and illegal trade along the border. In Europe, Hungary, Croatia, Slovenia, Italy, Denmark, Greece. .. took serious measures to prevent undocumented migrants with some of these countries erecting a razor wire fence along the border. What has been worrying the US and European nations is the ‘ trafficking of fake documents for ISIL’. According to the Guardian report in 2017 ISIL had been paying the smugglers fees upto $ 2000 to child migrants to ‘radicalise’ children for the group. Nearly 88300 children reported as missing run the risk of such radicalisation. Economic migration is beneficial and is also crucial to the growing labour market of the host nation – according to the report by OECD. And the report also adds that such migration is not the cause for disrupting the nation’s GDP. 4. Build a wall/fence along the border. Solving the problem of illegal immigration is now a priority to most nations due to the increasing political, social, and judiciary concerns. It is also the responsibility of every nation to safeguard it’s citizens and ensure for them a safe, secure, and spirited life. The above details in this piece are just diagnostic in nature to advance specific efforts through studies and procedures arriving at a better and practical outcome. Question 1. Is there an universally accepted solution to the problem of migrant crisis ? Answer : No, beyond my ken. Question 2. Who is right and who is wrong? Answer : Everybody is right and everybody needs to do more. Question 3. What is the best that can be done ? Answer : An AI study may probably help identify the best solution. Proprietary or choices. Try as long as you do not ask me to do it.